The game is 7v7 on a youth sized 9v9 field with a minimum of 10 games per season. Each player receives Secondary Medical Insurance if injured during the games. USSF Licensed officials for each game. A guarantee of at least 10 games. New Team Captain’s Meeting: The Captain’s Meeting for New Teams will take place Sunday, February 17th at 6:30 PM at the Peachtree City Athletic Complex Meeting Room. Team captains must fill out the team roster form by clicking here and e-mail it to [email protected] and [email protected]. Individual forms and payment must also be sent in for each player. Any team who wants to participate must turn in their team form by Tuesday, February 12th. You can fill out a player registration form and we will place you on a house team or existing team that needs additional players. Individual players will be assigned after the Captain's Meeting. All registrations must be received by Friday, February 15th. Any registrations after will have a $20 late fee added. All hard copy registration forms must be mailed with payment to PTCYSA, PO Box 2403, Peachtree City, GA 30269. First Time Players - Need to purchase a Lazers Black Jersey and a Lazers White Jersey. Season: Season begins March 1st. Season ends by May 17th. Games take place on Sunday evenings with the occasional Friday night game. Games do not start before 6:00 PM. Rainouts will take place on Friday nights. To purchase a uniform, please go to our adult uniform online store by clicking here. You can also be sized and purchase your uniform at T&G Allsports. 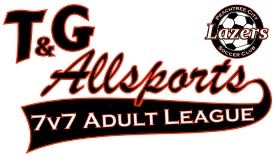 T&G Allsports (Phone 770-460-7700) is located at 100 Highway 314 in Fayetteville. Program Questions? Contact Dan Esmond at [email protected]lazers.soccer. Registration Questions? Contact Courtney Flores at [email protected].